This THP is about 13 miles NE of Fort Bragg, CA at an elevation of 450 to 1500 feet. 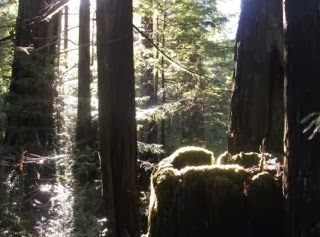 Campbell Timberlands is planning a tractor and cable logging operation on steep and unstable slopes in coast redwood, Douglas fir, western hemlock and grand fir forests. The THP area drains into the Middle "Clark" Fork of the Ten Mile River which is listed as impaired for sediment and temperature, and is an important coho and steelhead fishery. There are 12 landslide terrain features in the THP area including 5 failures related to poorly placed older skid trails, and 7 failures related to streams and steep hillside slopes. Tractors are proposed for use on certain slopes in units containing unstable or slide prone areas where deflection is low for cable logging, and in units designed for cable logging in units C and D to yard logs. There are also multiple road failure sites including fill failures, bank slumping and cracking. 16 road drainage sites are planned for work including rocking, dip construction, culvert repair/replacement and ditch cleaning. For spotted owl site MEN0460; This THP will result in the loss of 51.2 acres of nesting/roosting habitat within .7 mi, and the conversion of 46.5 acres into foraging habitat within .7 mi. An osprey nest and marbled murrelet habitat were also reported to be near a haul road. More information is available on the THP Tracking Center website.